This rare quiver, now attributed to the Nez Perce tribe, was originally thought to be either Shoshone or Arapaho. Made from otter skin, this cylindrical case is covered with geometric patterns of pigment. There is a bull's eye design on the bottom of the case. In the late 1870s, U.S. Senator Daniel Voorhees was given a Mandan man's shirt by a member of an Indian delegation to Washington D.C. 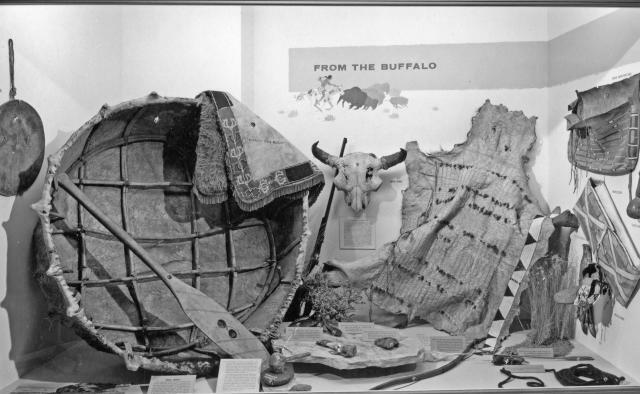 The shirt was later passed on to Professor John D. Mack of the University of Wisconsin at Madison, who sold it to the Milwaukee Public Museum in 1921. 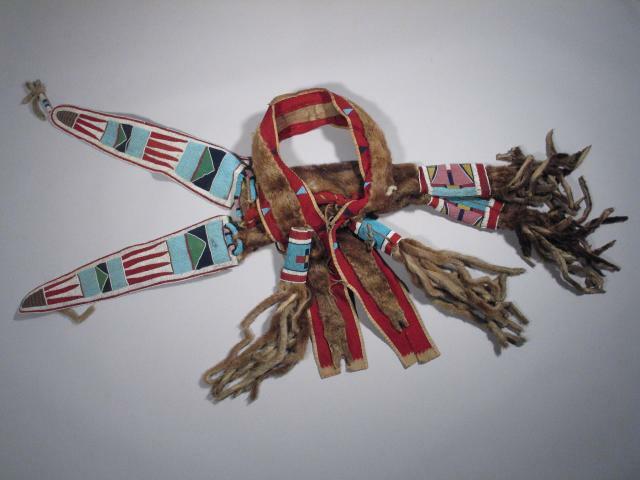 This elaborate tunic style garment consists of two buckskins sewn together. Four large extensions of fabric hang down from the central and most decorated portion, and extensive bead and quillwork adorn the shoulders of the garment. Based on the amount of porcupine quillwork versus beadwork present, it can be determined that this shirt was made prior to the reservation period of the Mandan people, probably between 1845 and 1879. An intricate system of incised images on wooden boards such as this served as a visual record of an event. 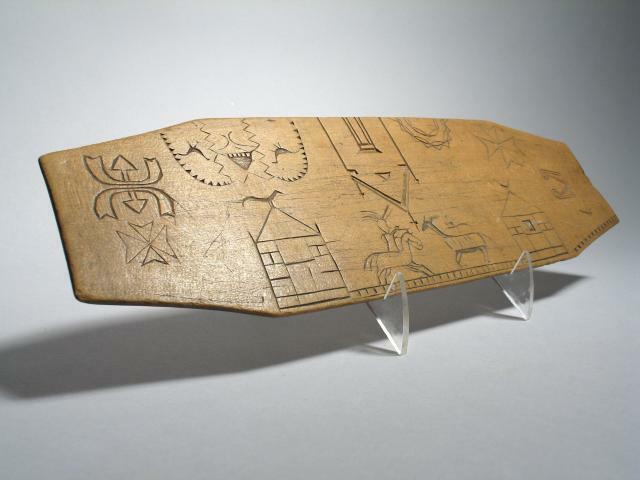 Dream or memory boards were typically an Ojibwe tradition, but tribes, including the Menominee, produced them as well. The figures on horseback, buildings, and geometric designs served as mnemonic devices for the owner of the board. Paintings from the 19th century Plains tribes serve as narratives of important historical events. This piece was made at Standing Rock Agency (now Reservation) in North Dakota. 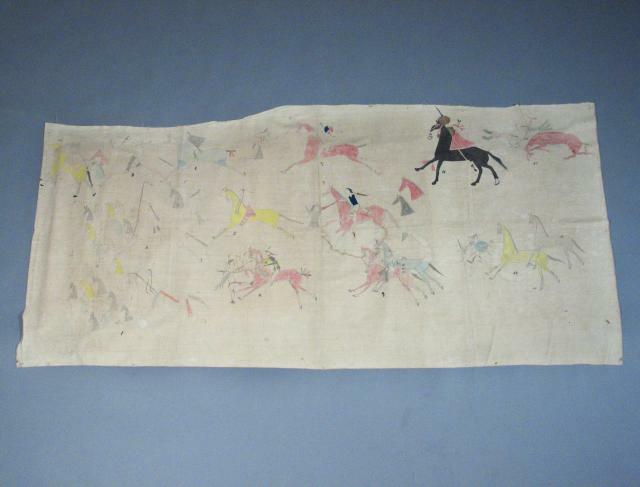 Painted on a large sheet of muslin, nineteen male figures and fifteen horses are complemented by an additional thirty-five horse heads in the lower left hand corner. Each individual figure appears to float on the surface of the muslin, as there is no evidence of a horizon. The scene represents the heroic deeds of the members of a Sioux group known as Gall's Band, one of the last American Indian bands to surrender to the US army, as they waged hand-to-hand combat with a group of Crow warriors. 96.) 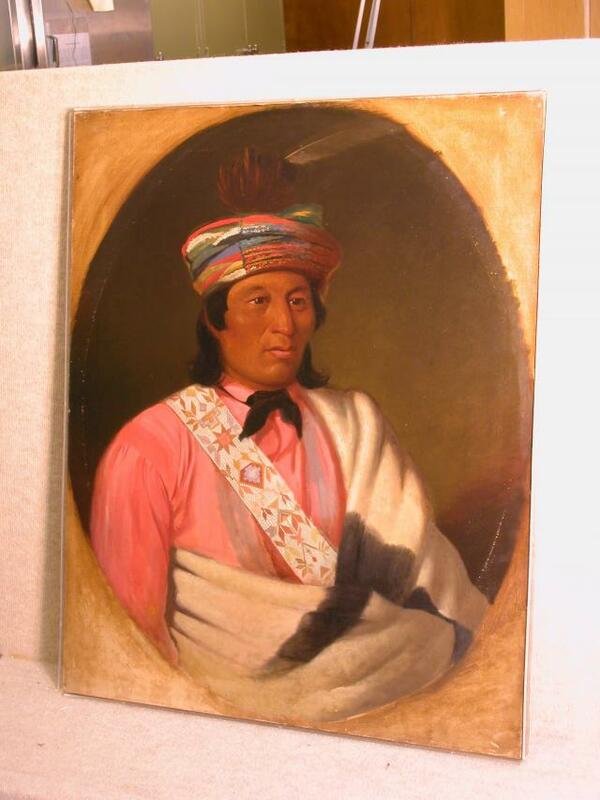 Portrait of Chief Oshkosh? Spiro is an archaeological site in eastern Oklahoma consisting of 12 mounds. Occupied from AD 1100-1450, the site was a ceremonial, mortuary, and trade center. The elite of Spiro had the power to obtain materials exotic to the region from such places as the Appalachian Mountains, the Gulf of Mexico, and the Gulf of California. The site of Spiro Mound was destroyed in the mid-1930s by treasure hunters. 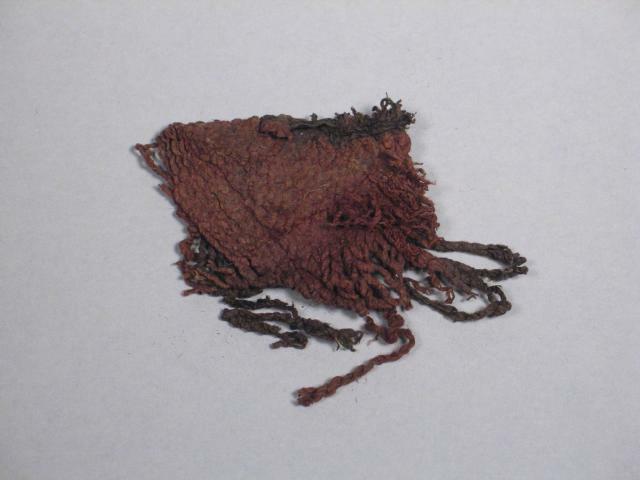 Perishable materials such as textiles were well preserved and widely sold and dispersed by the looters to individuals and museums. The severity of the looting left little other than these collections as the basis for any analysis of the site. The Milwaukee Public Museum's Spiro collection is composed of 22 items, primarily textiles and sheet copper fragments. 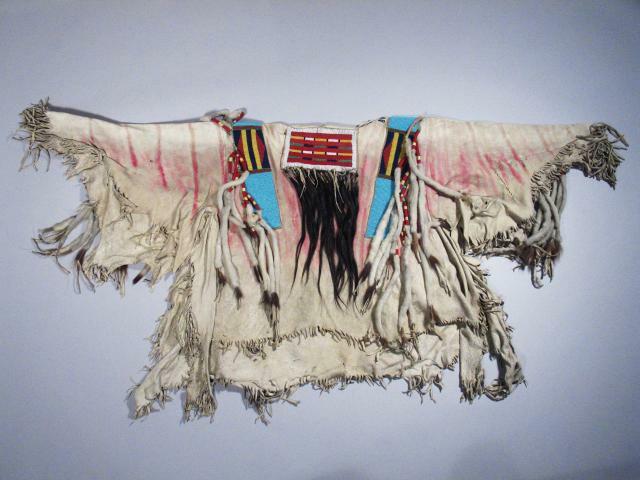 This Shoshone war shirt was collected by E. C. Leffingwell of Milwaukee in 1878 north of Fort Washakie in west-central Wyoming and purchased by the Museum in 1900. 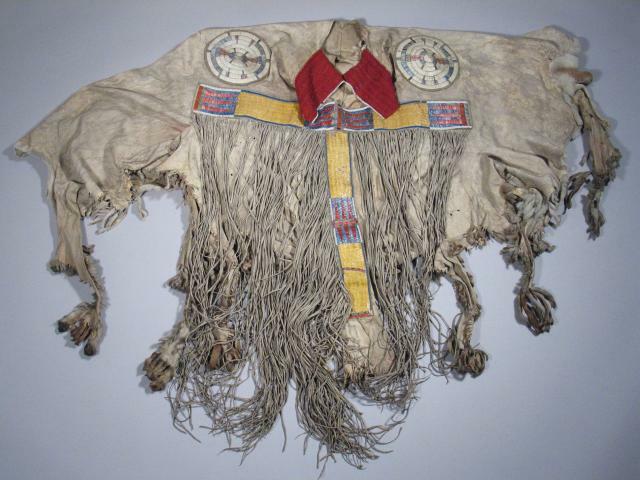 War shirts were decorated with the owner's individual war triumphs, common materials being quills or beadwork, ermine tail pendants, red stroud, and tassels of horsehair or human hair wrapped in strips of trade blanket. This belt was obtained along the Kuskokwim River in southwestern Alaska. The Unegkumiut, Kiatagmiut, and Ingalik groups are the most likely sources for its production. 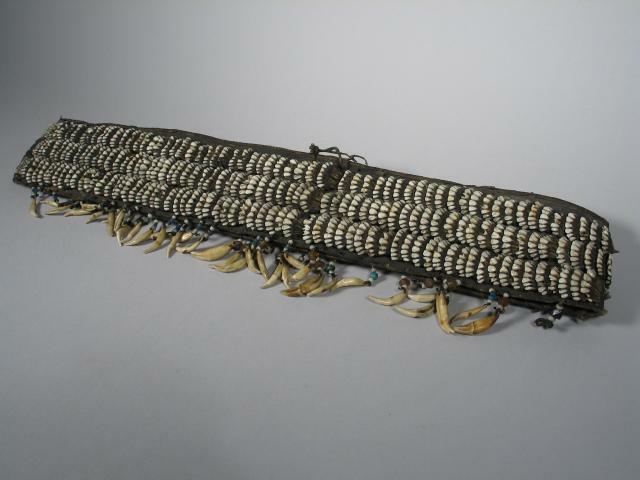 351 sets of caribou incisor teeth are attached to leather, with a fringe of Russian trade beads and fox canine teeth. The belts were made by men but worn by women as displays of the man's hunting ability. Each set of teeth represents one caribou. These belts were usually family heirlooms that were thought to have curing powers which increased with the age of the belt. This belt, the only one of its kind in the Milwaukee Public Museum's collections, is approximately 300 years old. 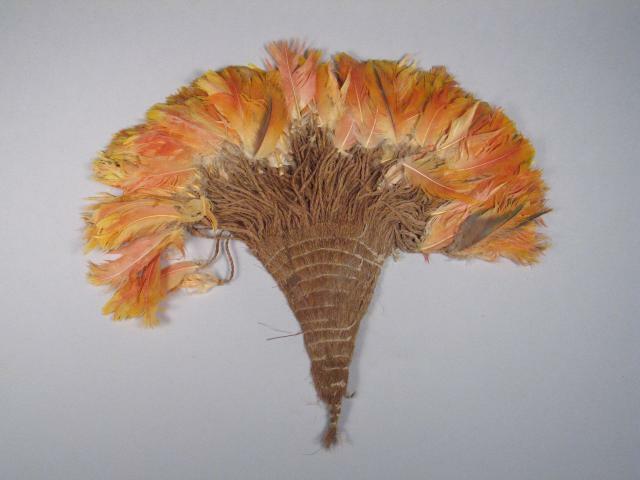 There are 115 pieces of archaeological Peruvian featherwork in the museum's collection. A majority of the items come from the collection of Malcolm Whyte, a former Milwaukee attorney and civic leader, who donated them in 1964. Most of these items come from the southwest coast of Peru, and some are believed to be from the Inca civilization (approximately AD 1400-1532). The items are very delicate and rare. The dry air and heat of Peru preserved them in burials for several hundred years. Objects from the collection can be seen on the 3rd Floor Pre-Columbian Mezzanine. The boat and paddle were made by the Crowsheart Mandan at Fort Berthold, North Dakota in the early 1900s. This boat is made from a large cowhide, though traditional boats were made from buffalo. The bull boat has a bent-pole framework covered by the hide, which makes it waterproof. Circular boats are rarely found in North America and were only used for crossing rivers and streams, not for long journeys. This boat is 5.5 feet in diameter with sides 1.5 feet high and could carry up to five people.